this little shop fell hard on earth and it felt good. before the fall, there was a summer in 2004, a viennese summer filled with phone calls and waitingful afternoons for call-backs that never even felt like ringing us out of sleep, us, like me and brother Deewan who he himself had fallen hard on Viennese ground on EKH third floor, EKH being a punkful sharing friendly house, a noisy ground filled with the timeless people who open rooms to all the timeless mates who happen to fall into baroque Vienna, and who regroup themselves in ethnic floors: 2nd African, 3rd Asian, Asian meaning subcontinental plus zones of war. back to the Summer of 2004: brother Deewan did not happen to sleep too well on 4th of May 2004, because there was some heavy knocking on Deewan’s door going on in very early morning time that means no friendly timeless people would be knocking, they would just have fallen into heavy sleep, far away from heavy knocking, even more far from bothering the brother Deewan and his mates about his Ausweis and his Date of Birth and Ausweis Ausweis always means in any language Mitkommen in any language and so he went with them. how come? well, brother Deewan showed his British driving license Ausweis which was nice but fake and everybody knew in 1 – 2 – 3 that this was not a good idea this even was a very bad one for better you say you don’t have any than you have a false one but who knows better at 6 o’clock a.m. plus heavy knocking on sleepy haven’s door – but why not say straight here I am my name is a – b – c and here you have my papers and now let me sleep? ‘cause sleep is for the Europeans, hard edge wake is for the rest that might not have the right to stay or else the right to move or else the right to move and stay, oj vey – so brother Deewan did as told him Shlepperbruder Kamnitweit and showed his agenetically modified trans-europe driving Sesam, with short but decisive stop in beautiful Vienna, city of Waltz – but why not say straight here I am, I am from Pakistan and now I want to stay in Wien, on beautiful blue river Danube? ‘cause there is more beautiful river than river Danube which is river Thames which strongleholds the Land of London, the rainy town up north. Why go to rainy towns if beautiful Vienna gives much more comfort to transcontinental driver Deewan? Because of friends & family, eternal glue, and English Language, as we see right now, why use some looney woodchuckers’ Germanidiom if sweet gloomy English is at mouth and lies therein word after word for word in loving memory? So was there some explanation for longing north and moving through the heart of Europe, still, some use should well be made of such unique a trip and see the beautiful golden Vienna whilst waiting for further instructions like how to proceed … northwards. So how to choose which use to make, well before choosing comes considering and never consider whatever things empty-mouthed and belly-void this is to be said in first and primer place so this is clear. - Where can I find some food, like good food, Indian-Pakistani food around here in Vienna? - Like here and here and there. - And can I cook there by byself? - Is there a place, where Indian-Pakistani people live and cook? - And where is that? That’s how brother Deewan found his bed&breakfast/lunch&dinner place, where he arrived in suit and tie amidst the timeless people and their dogs and found a pot and also fire and cooked his first Vienna spicy dhal in EKH, on Flughafen-Sozialdienst-floor, in end of April 2004. Now there was Indian-Pakistani people a lot and also Africans and also of course those who run the house in the first place, not only housing but also a beisl, a „disco“, a giant stage, that would only be filled in Haus- and Hoffest times, so music was going on, heavy noise music mostly, a studio for heavy noise music exercise, a studio for printing shirts, an anarchistic library, „volxbibliothek“, for use of folxes as diverse as would fit into black and dark (hairs be exempt) and then there was a Ladyfest and before that, there was the Schubhaft. Schubhaft is for foreigners and foreigners alone who are suspected of going underground and not by metro by the state they have „invaded“, so the official view and talk and do. So do they come to closed doors and knock them open by the power of the state and shout their Ausweis Ausweis and then make the findlings gemma gemma out of context into Schubhaft where they should stay and stay on and on and on again until a Wunder happens, such a Wunder can fall down from sky vertically or horizontally from Dessi also, which is short for Deserteurs- und Flüchtlingsberatung, so they bring newspaper, cigarettes, calling cards in, in a first place, and in a second, try to bring their clients out, in a few days, few weeks, few months, they shift their findlings out, file in appeals, file in whatever statement needed to protect whomever be in need from jail which is called detention center for better wording, residence area for the residenceless. Now when you sit in Schubhaft residential area, you don’t expect there visitors to come and care, so also wondered brother Deewan when a visitor did come and knocked him out and cared a lot and cared so much, that brother Deewan after 10 days only could bye-bye this residential place and leave his inmate colleagues back behind in jail, pardon, back in detention. He shifted back to EKH, businesssuitandtieless this time simply brother Deewan, asylum seeker Deewan, cooking Deewan from Pakistan. Not too well looked upon by his Kollega, brother Deewan found asylum in Muhammad’s place, Muhammad from Pakistan, Chacha Muhammad (= Uncle Muhammad) the house’s oldest inhabitant, living from 13 years with his „family“, EKH family that is, took the fallen businessman, took brother Deewan in and let him stay in peace. But peace was none with brother Deewan, what to do in Germanidiomistan, how to proceed, better to leave a.s.a.p. and move north somehow somewhat on loose ends brother Deewan considered his sort, and as the custom goes: never consider things empty-mouthed and belly-void said brother Deewan and took a pot and started cooking, cooking takes a long long time and better cook for 10 than cook for one alone, much better ratio counting work and time per person, so even better cook for 20 than for 10, more better even, much more effective from a business point of view. And business did develop pretty soon, since time was there and pots and gas and brother Deewan to mix the items needed into food, perfect food according to the timeless people, who appreciated what was happening to fireplace and pots and found their meetings well becooked by brother Deewan who quickly found a way to share his food with the entire world, starting with Reumannplatz passer-bys, who in turn seemed to appreciate as well well done well cooked and 1 – 2 – 3 emptied Deewan’s stock of white-foamed boxes featuring Alu Gobhi, Rice & Dhal. 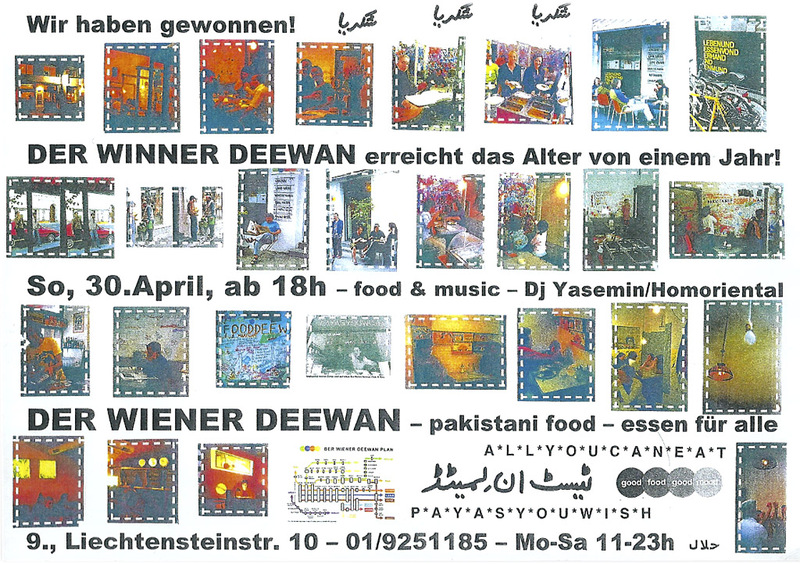 But business, even take-away business on fly-away basis is not allowed for a lonely asylum cooker like Deewan without concession let alone registered cooking place, the Reumannplatz cooking place license holders told Deewan without delay and so the Reumannplatz flying take-away business closed without delay as well. Well. What to do now, better to leave, better to live away, better to leave without delay, but brother Deewan, don’t you leave right now, wait a few days, there will be party party the whole weekend long, the EKH Kollegas told their depro brother Deewan. being not at all in party mood, neither yet in any other, brother Deewan did not have to cook too long to know that he will stay a few more days and see what do they mean by party party in Europe. The party mentioned was the Ladyfest, a feminist music do it yourself spirited festival in start of June, many a crowd was there many a funny people, any gender welcome it said any music allowed except unnoisy unpunkish unloud music and so it hammered through Thursday, Friday, Saturday, Sunday and on Monday, a difference was made. What kind of a difference was that? First there was a difference in style, observable to those who have eyes to see: On Friday night, there came a girl who was very obviously not part of the crowd. The most distinctive sign for that was that this girl was skirted, but not mini-skirted, skirted in some flower-patterned ankle-lengthy kind of clothes, an anti-punk appearence rarely seen before in antidom’s High Church of No, a no-no in the place of no, „she don’t know nothing how to dress in here“ the comments went from brother Deewan’s and Muhammad’s side „she never been this place before“ they did agree and wondered what this womanalien might look for in this crowd of noisehopper ladies, decibeljunkies, highbeatjumpers & co, did she ms. take the riot „lady“fest for ladylike behaviour? What a Ms. Fit! Mrs. Misfit! What a freak! There she talks to this black guy, this is not English but no German either, ah now they’re gone, ah now we know, ah now we know it, so it went but then the Ms. Fit reappears, after having toured the house and seen the Asian and African floors, she is heading for the dancefloor to complete the visit. - Sind Sie zum ersten Mal hier? - Are you here for the first time, too? - I am living here, upstairs, for some days. - I see. Do you like to have some water? This was a bit out of a sudden now, but what to do if some alien lady offers you a drink and be it water from the tap? Accept and say can be cannot be wrong. So there she goes and takes some lonely glass, goes to the ladies’ and returns the glass washed, waterfilled and offered to the short-haired lady sitting on the dancefloor sofa. Upon which followed Deewan’s second interview after Bundesasylamt, what’s your name? Deewan? beautiful name, how come you live here, where do you come from, Pakistan? 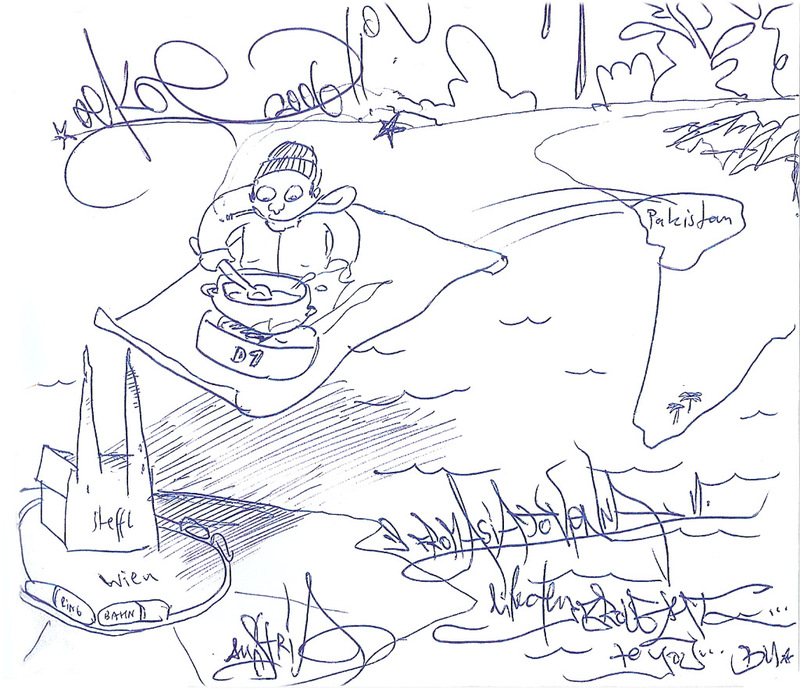 And what do you want to do in Vienna?, in the course of which Muhammad Afzaal Deewan, male, born 25th of December 1964 in Mandi Bahauddin, Pakistan, subsidiär schutzberechtigt gemäß §136b AsylG, produced his ID, this time authentic, to prove his given data true. So, this distinguished lady proved to be a lad, so take it or shake it then and the skirted ladygirl from outer space took it and it shook her hard. Since now it came to her to find the answers to such distinguished questions such as How can I work with my own hands while they are bound by law i.e. while being on asylum and waiting for my interview to come and change my status, given they will give a positive reply and sure they will they have to simply have to since I have my proofs. And so it went that Afzaal Deewan found some hook, some hook to cling to and began to leave the leaving and to start some starting thoughts instead, start what, some business? how? Good questions deserve even better answers and so I went to find them, where, well, let me check. And checking there was some and more, Can you check the book on tariffs and trade, well, yes, maybe, but let me see first, whether at all you can do anything on your status, and looking went on deep into early Summer, looking being mainly hearing what telephone advisory services would produce, the Chamber of Commerce / Section A for Asylum Seekers was not yet in place which left us with rumors and guessed proposals or straightforward ignorance from both the sides: Chamber of Commerce people blanked out with asylum matters and refugee helpers vice versa blanked out with business – so far so tote hose. A few more questions did arise: What kind of business would it be? Anything can be. Anything ok, but what would you like most to do? Garments can be, … Garments? anything can be, garments, jewelry, food, … first need some OUTLET and then can decide. the OUTLET question then … as it seems there needs to be a license, trade license or Gewerbeschein to start whatever business and this license cannot be obtained while on precarious status, on asylum, that’s what all the voices tell, that’s where all the tongues converge: cannot, cannot, cannot, that seems to be their tongue-tongue’s end. This sounded nothing more than Abracadabra to me but seemed to be most legal Zaubertrank mit Krähenkralle, the most very potion ever drunk by hopeful if uneven entrepreneurs, uneven not only in culture, age and residence status but also regarding the outline of their future lives: stuck in letters, one of them, abhorring people more than one a time and business is for the busy people. The other is a cricketeer, cook and moneytalker, moneytalker before the god, cooking rupees into pounds, cutting some euros into the soup and spice it up and let it stew – ok, but now let’s cut the cake and see – how much rupees are there for a start? Half a million … and how much would that be in Euros? A few thousand … five, six thousand … ok let me check what that would produce. „If you have 5000 Euro, go and put that money to a bank and let it stew in peace and quiet there … let me give you this advice, you are nice people, youngsters, don’t you throw your peanuts to pigeons“, that’s what Gastromakler No. 12 told the nice young lady on the phone when asked about his Imbiss zu verkaufen in the outer outskirts of beautiful Vienna, „this is a place where the Hausmasta of nearby Gemeindebau takes his dog for a walk and that’s it“ he added, and that was it then. The Austrian partner was not yet fully won. Well, how would winning go? What would that winning be? Winning and losing need a game and that was not completely on the table yet. What kind of game was it, that was going to be played? Was it a sharing game, a game of give and take? What was at stake? What were the rules? Was it a win-win game and then, what currency was on the table, „what would it mean – to win“ ? In order to win – have nothing to lose: go on and start the game. Step 1: Find an Austrian Partner – what partner? Business partner, if it were, partner for good & bad, for better or worse, a diligent partner (what does that mean? ), a partner who cares (who cares?) a partner who thinks, but does not think twice, a daring partner in cards who starts off and goes for closing, announces a trump marriage, „40 points“ and sets off to take it all – or nothing. Nothing to lose, you better have nothing to lose – or everything saved in a lifetime of 25 years – you better have nothing to lose or everything ever dear to you, stop it or leave it, close it and open another chapter for better for worse. cornflakes to curry: food before Deewan (b.D.) was looking like this: add milk to cornflakes, eat, repeat. Now, after Deewan (a.D.), getting food means: watching Deewan stir and stir and stir and then: all this stirring and stirring and stirring – only for two? for merely two? That’s nonsense, this is a waste of time! Cooking should be done for many, not for two or three. After cooking, getting hooked and looking: where could that cooking happen on? Maybe there, this Würstelstand in outer space looks out for the unthrilled adventurous gastronaut willing to set foot or food in unarable or unbearable land, for merely _______ rupies, 7000 € that is. The Austrian partner-to-be dialls the number and finds the very Viennese gastro-agent at the other end of the line in semiparental mood: Young girl: if you have 7000 € in your hand, then, please, take it and bring it to the bank and leave it there so you will see it again, after years, and it’ll be safe. Don’t you even think of investing it here, this is a place, only housemasters dog would be your guest, take your money and my advice: keep your fingers off this place!! Hundred phone calls, dozens of visits, a handful of negotiations later, the outcome was the same: forget it, put your restless hands into your empty pockets and wait, the state will let you know and you don’t interfere into your very own affair, your matter will be treated and you try to please comply with your condition: you are on asylum and not on a business trip, this is Europe, don’t forget, forget it, … and so forth. But someone did not like to listen. And did not stop to cook. The cooking place had changed, my so far badly neglected kitchen cupboard finally rejoiced with spices, rice and dhal, some bits of Urdu were exchanged for pieces of the German language / Austrian shade, and, eventually, also the marital status grew to be a topic in the house and preparations started to unfold. The Austrian partner did her best to gain more knowledge, the „man who lives in kitchen“ tried for cash – knowledge did increase, cash chose to go the other way, since calling cards, like novomatics, did not return investments placed on them, debtors chose to not attend the calls from Europe and quite some „friendship“ went in ruins. So how did the just established household supervive? Food was the duty of the cooker, the rest was done by German language: teaching German brought some cash, learning German properly was not and not for long. („no German storage place to let“ …) And Grundversorgung? This basic income for asylum seekers was granted … for those arrived after the 1st of May 2004, for previous arrivals: love & air. The abovementioned sighted shop was a 10th-district, white-tiled Pferdeleberkasery, a sausage seller, a Jausenbro:::tler, one hidden cooking place for „Laberln“, two tables + four chairs, 4 antique fridges + vitrines, large windows, 20m2 + a few, one promised chimney (hidden), a tram and bus stop and 35.000,- Euro the key – cheapest price in months of fatamorganic gastro trips and leerelokale.at & co. Well, the first guided tour left quite some questions open – will there cooking be allowed? Will the chimney be allowed to build? And in the start, how will you cook in this 2 m2 hidden tiny place, how will you breathe in here? Oh this is nothing, oh I have done worse, oh I can do that, half a year, no problem … well … And who will work in front? Oh you can come, then you can teach and after that you come again, the metro is not far so you can come and go and come … and the two old ladies, who sell sausage now? Oh we can keep them, if they like to stay, everything can stay, just whitewash, if we rent by January 1st, then we can start on 2nd, this is nothing … nothing? Oh, nothing at all. Ok, if „nothing“ left to do but „start“, then lets go and ask for credit – whom? A friend of mine … The friend did listen with ears open wide and eyes in wonder and agreed to lend a sum of 20.000,- – but just in case we really liked the place and knew we want to take it really. The rest would then be rounded up by savings of the last 2 decades on my name … But still – it should be liked – and really – and this was doubtful and in doubt, if one would cook, I would start calling up & down to see, if not some expert could be found to view the place and check it please … the one that does exist and offers visits was not to be reached, but what is more, the service itself was denied … don’t have such thing … and expert friends are busy, that’s why they are experts and not only friends. We ended up by asking ourselves: Now are you sure you want to try it with this place? And sure was given and so was the offer signed, 35.000,- in cash was counted and put in custody until the final signatures would be exchanged. If learning goes with pain, stupidity should hurt alike and best before … Two facts were found in Thursday early morning: 1) calling the chimneysweepers: according to the plans, no chimney was there never going up behind the wall and any pipe would cost more than the shop alone, 2) calling the Magistrat produced what should have been checked first of all … (now, we knew): there was a license for the shop, but this was not for cooking, but for selling, the so-called Gastro license was for Jausensemmels, Knabbernossi, Coca-Cola … not for Curry, of course. When reaching the lady for the „final“ step, she overfriendlied us inside, only to discover that our mood had changed and that we did not look like signing – why? Well ’cause we did – at last – our job and took some information that’s not congruent with yours and with the agent’s … – What do you mean, nervosity was steaming up the other side and then we meant it’s time to leave, collect the money and think double twice and twice again if ever … The man who held our money safe, accountant of the lady over many years, friend of the family, felt cheated, even more than us, by her, returned the money in a nearby bank and closed this chapter and we closed the eyes, blue eyes wide shut, 1000,- Euro each, each paid their share, their fine for candid naiveté, 2000,- was the agent’s share of the fatamorganic shop, which turned out to be … our entry fee in business. - Wasn’t there to be a match? - From sometime now to sometime later. If business deadlocked, issue n* b did not, it was postponed for paper reasons, the marriage license being late, the marriage license approval + marriage license approval translation + marriage license approval translation certificate + marriage license approval translation certificate attestation were late as well and pending was the issue over many months along with issue n* c like Company: Schellander&Partner KEG did not make it through the gates of Handelsgericht – the limited partner must not appear within the name, even not as unnamed „Partner“, Schellander KEG would not really fit the goal, let’s wait for the new name then: Deewan KEG, after Deewan, the Austrian partner in spe. And so it went: Not Muhammad Afzaal Schellander but Natalie Deewan was adopted as a marker for the change that did not go unnoticed by the Fremdenpolizei who has to check those counternatural (counternational?) proceedings now by law and sends some Ladung, like an invitation for breakfast into Schubhaft house and bring your instruments, no: documents and answer truthful: are you going to marry M.A.D. next week by your own free will, (are you my mother?) yes, not for money, no, so this is not a paper marriage, except for the marriage license approval translation certificate attestation paper not, i mean this is no fake, no this is not, so this is genuine, any other questions? How did you meet, how you communicate, how you survive, by shooting Stadtwild, innercity dear is this ok? Pigeon fry, Rauhhaardackel masala, German wings and Curry food for Charities & Solidarities, which was praised by words & coins, donations did increase with Deewan’s spicy curry food, the Erbsenprinzessinnen, calories counter girls did go for second, third, forth, fifth buffet rounds to pick some more of Chicken Methi, Alu Mutter, Suji Halwa & Co, one office Mittagessen offer came like when you have a shop then come and lunch us all, one beisl Abendessen offer came like come and dinnercook us once a week maybe, so it was schmeck’d and tongued for and cooked and eaten and schmeck’d again. On February 3rd, 2005, a Marry-Match took place, rings were clashed and letters were exchanged: one name underwent an operation in consonantal change: Schellander à Deewan, vowels stayed the same (Mitlautswechsel, Selbstlautsbeibehalt). Food was given, gifts received – 12 wedding ashtrays, metallic & triangular, Mitgift for the future shop as well as wedding fork & knife, one pair for two, for one to fix, for one to cut, for one to cook, for one to throw remaining meanwhile rotten rice&veg&dhal away, overfood from undervisited charity, in Fluc toilets & garbage room, on Wednesday, February 3rd. February 28th: Rumpelkammer rented! What? Again? The rotten shop experience renewed? Not thrilled enough? Not grilled for life? Not yet gebranntes Kind? No, only fingers burnt and wrapped, ready to sign again, signed by Deewan, paid for by Deewan & Deewan: 35.000 to be paid for the „Steakhouse Zum Wilden Stier“, formerly widely known as „Rumpelkammer“, formerly known as „Teddy’s Espresso“, back in 1953. This post-war beisl had developed into one of the formerly youngs’ most popular meeting places, eating place that was: workers’ steaks for students’ prices – how you want to top that? the neighbour carpetshopper wants to know, this area is dead, but welcome … and good luck! Good luck!, said the immo shark to the shaky two curry crickets under his moneytoring eyes, and added another, a forth month of rent to the demanded deposit amount, over 4000,- in cash, just in case. March 5th: Deewan KEG registered! The shop has more than 1 2 3 4 5 6 7 seats + 1, add a nought and it gives 75 seats, 3 floors + Schanigarden tables (2) and chairs (4) on Liechtensteinstraße 10 trottoir. This is not the Deli Deewan Imbiss anymore and not the little „outlet“ window shop or Curry Standl, this has Hauptberuf dimensions, Hauptberuf for 2 + 1: shopkeepers (2) + license holder: the freshly fried philosopher friend with academic license to … midwife a restaurant that asks to be born, accepts to do – and off we go: What should it be? How should it look like? How will we name it? Time is running, rent is paid, now think fast, think right and no mistakes! Rumpelkammer was unrumpeld, room by room: room no.1: a 6 x 6 x 6 m3 cube had had its beauty veiled, the giant windows blacked, its hight and heating costs divided and thus its upper meters spared for Spiders for Peace, a network, that was brutally dismantled after – well-becooked – consideration: eins, zwei oder drei – letzte Chance … vorbei! Yes, we want this ceiling down and have a look behind these pizzeria walls as well, and have a look beneath these camouflage type tiles – not add a third but smash the second layer, sous les pavés la plage. From deep down under smoky ashes, dark brown noakriagal wooden walls, Kukuruz & Wagenraeder, phenixed up, bright and grey, the future land of Wiener Deewan, why Wiener Deewan, is there a chain, a family, like Mother Deewan & sons, the Brothers Deewan Wien – Paris – New York? Do you sell sofas? So far we don’t sell nought at all, we build and try to mold ourselves into the form, what form, the form we keep creating, and how you do? Hornbach will guide us, Bauhaus will tell, Blue Star will do the rest. Toilet doors, for instance: Bauhaus1 gave handle „Gents“, BAUHAUS2 the „Ladies“ one: an antiquaire’s 1-Euro-gift, handgreiflich, heavy, straight & strong the Ladies’ BAUHAUS2 handle was, silver matt, while shiny, gracious, curvy, smart the Gents’ Kollega bought from Bauhaus1 (Modell: „Alt Wien“), now, will the locksmith please insert this lock to that old door, fine, madam, we will do (one hour later): what is that? the door cannot be closed at all – ?! Madam, you tell us fix lock, but not fix lock close door … Exactly. So it went that what was not expressis verbis told, untold, forbidden – that went wrong and had to be repaired and fought for impressive verbis and obtained, while good food good mood was under way in kitchen, that possessed official kitchen status, at least, and did its best, as starter’s kit’, to please its new becooker. – I would like to see the boss! – Just a second, let me climb down … (shake-hands) – what’s up? – I would like to see the boss, I want to sell him our wine. That’s fine, Mr. Wine, here I am and be aware, der Chef ist immer der, der fragt … Gone Mr. Wine came Mr. Beer, then Mr. Soap, then Mr. Visa/Master/Diners, then came Farmer Hertl with a truckful of ALU from Oberschoderlee, oh yeah! ALU? Like ALU PALAK! ALU can be matched with PALAK, GOBHI, METHI, MUTTER, GAJAR and many more as can be guessed from Deewan’s flimsy notes on what actually he did intend to cook: Tinda, Tory can be, Alu Gobhi, Alu Palak, Alu Mutter, Alu Mirch, (…) Lamb Palak can be, Lamb Karahi, and Chicken … Methi, Chicken Mirch, … wait a second, this can be combined … and thus some PLAN was needed not to lose the last bit sense of order in this lunatic enterprise – a PLAN should come and systemize it all: WORD was asked for help, Microsoft Word, and thankful for the challenge, took it up and roamed a full night through and then delivered in the early morning what should guide the buffet errants through the jungle curry land: DER WIENER DEEWAN PLAN was there! Featuring PALAK and METHI, CURRY, KARAHI, etc., common stops, crossed and shared by different lines: the ALU, VEG and DHAL line above, the CHICKEN, BEEF and LAMB line down, then lines for Salad and Sweet and the footpath between salty and sweet: between Alu Methi Gajar and the Gajar Halwa stop, footpath because of the fact that the menu resembled subway maps and while some took it for a copy of the London tube, others looked for Karlsplatz at Alu Gobhi’s – in vain. A doc file was it, as the opensourcy mailinglistlers did not fail to note, pure evil, but contentwise good food good mood, a promise, and further, quote: „all you can eat – pay as you wish“, end quote. Forward? Sounds crazy but spicy, trashy and tasty, … > forward for WORD’s sake. „Exchanged your studies for a spoon, hey?“ sneered Mr. Dünkel, „Durchgaengig warme Küche, hey?“ jeered Mr. Spott, „Couldn’t find a more dead area, hey?“ , scoffed Mr. Hohn. Motherly fear hid in the teasing gown, manic panic dressed as mockery, nothing but ridicule came from the mother’s side who definitely was not on the daughter’s side, who obviously had lost all her senses: throwing her life away for a promising potato peeling career – so, you studied French to become a Wirtin? added the grand-mother with disdain, and: have you gone mad to marry?? Yes, gone mad, like M.A.D. 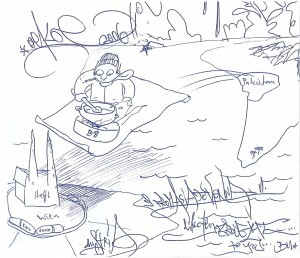 , or „Hans im Glück“ as he was drawn, eyes closed and cooking: mother’s comment to what escaped her madly. Belittle what you cannot grasp, so you will win the fight against your fear … that child is up to jeopardize her lifelong savings on an enterprise that’s doomed to die and then – ? The mother on the other side of planet earth did give consent and benediction to what her son might want to do in faraway Europe with this „angreez larki“, the girl, that spoke in English on the phone, but was not English but something like German or similar or maybe Australian? She made a passport, the first in her life, in order to represent herself and give her „No Objection“, in written and stamped in office, a paper to certify that M.A.D. is free to „marry lawfully anywhere to Austrian National girl according to his own choice“ and she precisely has „No Objection“. She was the one who taught her only son to cook, she and her mother took care of his tongue and gave him the seventh sense of spice and flavour. And then little Deewan dropped his studies – not for a spoon, but pot for bat, hit the ball and started a life in cricket. A man of many talents entered cooking, then sports, then business, then politics, but on the side, not on the front, drumming against the self-proclaimed „CEO“ Musharraf which earned him visits and threats of the police who doesn’t speak twice, but acts, and surely not with much song and dance. This led to his mother making plans for her dear son: to go abroad. Afzaal, don’t mess with them, they will come again and again and take you to jail and nail you down for things you haven’t done and then – ? So Deewan listened and agreed to leave in April 2004, at least until 2007, he thought, date of the next announced elections, the first ones in the new century. He finds an agent who will path his way to England, via Karachi, Dubai, Istanbul, Vienna. In his bag: the aforementioned driving license (genuine British leather, of course), a copy of the Bangkok Post („Volvo Scribblers win Post Sixes Trophy, Diwan … set the stage for victory.“) a catalogue of Pakistani Handicrafts (biznesse oblige) and a tourist guide of – Vienna. A scribbler of another kind was Deewan the younger: cooking words into a stew, new on the menu: cooking worlds, cooking cultures in a pot, Wiener Deewan melting pot: … halal culture meets vegan culture meets queer culture meets refugee culture meets kids culture meets yoga culture meets graffiti culture meets student culture meets djembe culture meets business culture meets sharing culture meets (re)cycling culture meets local agriculture meets DIY culture meets ramadan culture meets anarchist culture meets cricket culture … keep meeting, keep melting, let off steam. Let’s team off, then, who will join this enterprise, experimenterprise, and run around and cook around and clean around: friends of friends of either side of the galaxis, left and right from the the main axis of D&D, other Gastro-Arbeiter from Pakistan, India, Bangladesh, South Korea, Nepal, Nigeria, Egypt, Israel, Afghanistan, Germany, Spain, Chile and Austria, from illiterate to phd candidates, joined the team. /// and thus created a transnational & intercontinental hub & harbour, a place of unlikely encounters, facilitated by the unusual price policy that aims to make the place accessible to a wide range of people, (see above). „G’Bie“t = Gebiet, area. Every nightly newspaper distributor has his own area of delivery, which is colloquially used as denomination for the whole work à to go for „G’biet“, to do „G’biet“. This work is done on “self-employed“ basis, without social security, which goes without saying. Ab einer Größe von über 8 Verabreichungsplätzen ist im Gastgewerbe die Bestellung eines “gewerberechtlichen Geschäftsführers” vonnöten. Abgesehen von einschlägigen beruflichen Ausbildungen wird auch der Abschluss eines Hochschulstudiums als Qualifikation akzeptiert. … – ob ihr aber richtig steht, wisst ihr, wenn das Licht angeht! Army chief Pervez Musharraf took over power in Pakistan in 1999 in a coup. Bangkok Post, March 26, 1990: „The Volvo Scribblers rallied from the slot of „under-dogs“ to pull off a thrilling victory in the two-day competition conducted by the Thailand Cricket League.“ p. 16.